You see that picture of soup right there? Oh how I suffered to get that photo. My husband was out shoveling, it was 12 degrees out, and I ran into the garage with this nice hot bowl of soup and my camera and made him hold a spoon in the bowl so you could see all the delicious ingredients in that soup. A dozen or so shots and I was done. It was just too cold! Brrrr! So we got a whopper of a snow storm last week. Over a foot of snow, and while most people will hate the thought of all that snow, I love it. I mean I really love it. I am a snow lover. I love the way it blankets my whole world in white, the crunch of it underfoot, the coldness in the air. I adore a snow storm. The absolute best part for me is all of us the house at one time (rarely happens with two college students), big mugs of homemade hot chocolate, warm cookies from the oven and a huge pot of soup on the stove. That is exactly what I did last Thursday. I made what might have been the best soup of my life that day. 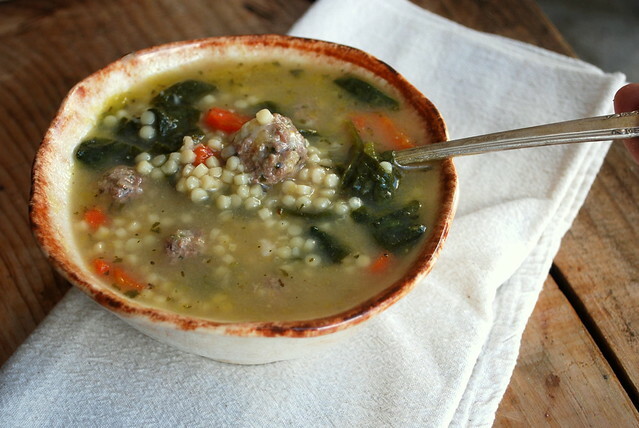 I got up early in the morning and made the little meatballs, then I cooked a chicken in a big pot and started on Italian Wedding Soup. One of my faves. I took notes as I was going along so I could share it with you all. So glad I did. This soup is so good. I mean really so incredibly delicious. I doubled this recipe. By Friday it was gone! In a medium bowl, combine all meatball ingredients and mix together. Don't over-mix it though. I use my hands to mix. Roll the meat into small little balls. About the circumference of a dime. Refrigerate until you are ready to use. Heat olive oil over medium heat in a skillet and then add onions, carrots, celery and cook until just tender. About 10 minutes. Set aside. Put the chicken stock into a large pot on medium heat (*see notes). Once the veggies are tender add them to the stock. Add in the seasonings and heat to a slow boil. Boil for about 15 minutes. 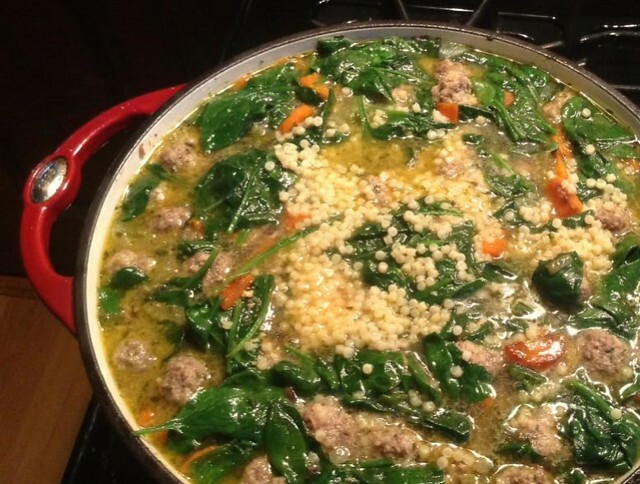 Put the meatballs into the soup and continue to cook for about 4 minutes or until the meatballs float. Lower the soup to a simmer. Now to add the pasta. I cook my my acini di pepe in a separate pot until it's very al dente and then add it in to the pot. I find that cooking the pasta in the soup makes it turn out very gummy and makes the soup too starchy. Add in the cooked pasta and the spinach leaves. Cook until the spinach has wilted. Add the Parmesan, give it a quick stir and your ready to eat! Mangia, mangia! Something my dad always said when the food hit the table! Note* You can certainly buy chicken stock but I like to make a quick chicken "stock" by boiling a small 3 - 4 pound chicken carcass. You can even do this with a rotisserie chicken. Just pick the meat off the bones and then throw all the bones and skin into a soup pot, bring to a boil and simmer an hour. Remove the chicken bones and you have a fast chicken stock! I save the chicken meat for another meal or freeze it for my next batch of chicken soup.